“Nest 70” is a reinterpretation of both the old shopping mall “Nightingale” and the new contemporary artist retreat. The new proposed building is portrayed using a collective voice. One sort of voice that is in tune with the radical changes that are needed in the contemporary artist world perception in Thailand. As artists are having a harder time “spreading their wings” the nest comes in the form of an incubator, sheltering and helping artist reach their creative genius. The overall volume has at its core the reinterpretation of how Bangkok is perceived as a city of layers. With a very young urban plan scheme and a rapidly growing population the city has evolved on the vertical axis with sporadic functions aimed to help its inhabitants. Thus, with this in mind the proposed volume mimics the vertical growth of the city. The layered streets are reinterpreted as overlaid platforms that span up to 10 stories in height. The denseness of the layers is accentuated with the play of movable poly-carbonate panels that naturally ventilate the building when needed. The intervention was conceived as an extension of the street, always in sync with the outside life. Thus, the ground floor opens up to the public, connecting its users to the open markets found in the back streets. The openness of the ground floor and its transitory function determined a central circulatory volume that has a smaller imprint on the ground, letting people not only transit the new building but explore it. Giving users the possibility of exploration new outdoor pedestrian walkways arose, always connected to the main inner one. On a visual perception from the existing building only a single element is present. The tightly knitted old concrete facade stands tall as a reminder of the old shopping mall. 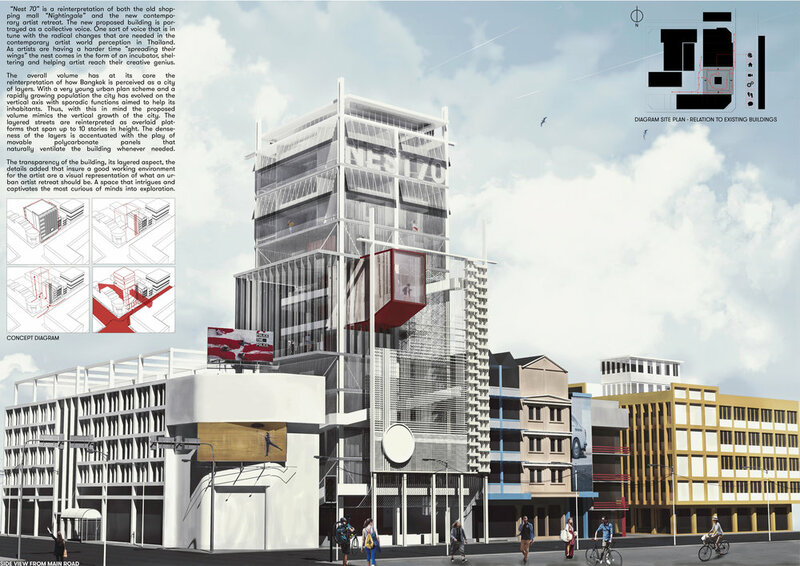 This time, a series of intricate metal bars were added, having both a visual reinterpretation of the main concept of the building as well as a functional task, acting as a double shading facade on the south side of the building. The main functions of the new proposed building are in direct sync with its intricate circulation system. 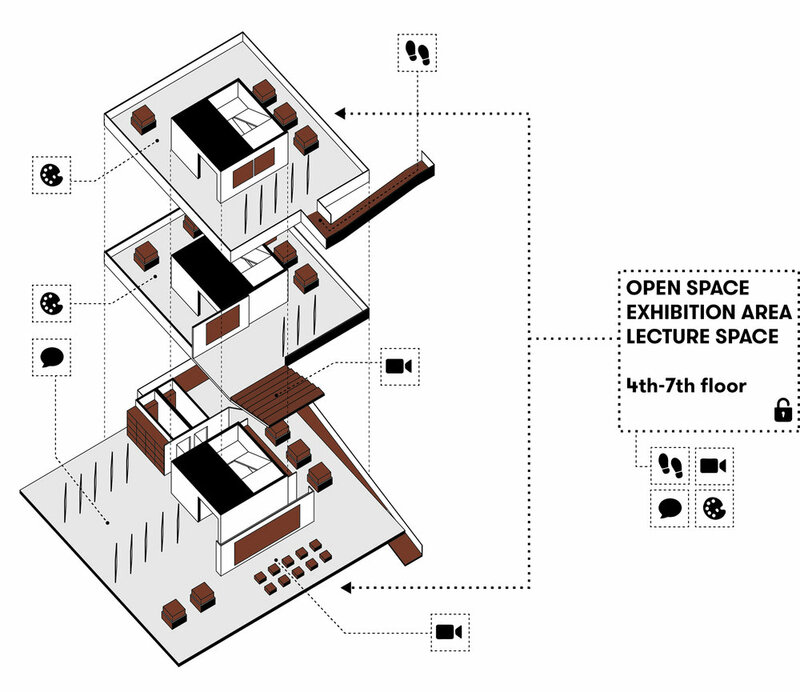 The lower floors are harbored by the public functions such as open galleries, administrative and management office, open artist studios along with small lecture rooms. The fifth to seventh floor act as a filter separating what is public from private. The upper floors shelter the private artist’s studios and the studio apartments. The apartments and studios are thought as a single element, a duplex floor plan separating the artist’s studio from his resting space. Having this duplex artist-studio apartment scheme determined a total number of 9 of such studios, centered around a common dining and kitchen area. Details, such as the crane, specially placed in the biggest exhibition area inside the “Nest” or the knitted open facades that naturally ventilate the space are elements specially created for the artist to ensure productive work flow. The transparency of the building, its layered aspect, the details added that insure a good working environment for the artist are a visual representation of what an urban artist retreat should be. A space that intrigues and captivates the most curious of minds into exploration.